Twelve per cent of the global fish catch comes from the South China Sea, but that fishery is headed for collapse. This will have important national security implications for regional countries and Australia. Ensuing security tensions will be exacerbated by fishing nationalism. Establishing a sovereignty neutral international fisheries management regime could resolve this and encourage habits of cooperation amongst claimants. Consumer states and civil society will need to play a role to achieve this. Australia should support the establishment of a regional fisheries management organisation to preserve the fish stocks of the South China Sea. Australia should offer practical support on fisheries management to regional countries. Civil society should promote, and governments support, greater transparency and awareness on fishing practices and marine degradation in the region. The individual sovereignty based approach in the claimant rich South China Seas is impeding management of this valuable resource. Increased scarcity and fishing nationalism poses the threat of clashes and conflict. This is something that Australia, the international community and civil society should care about. Australia and other like-minded states should encourage key South East Asian states and China to look at a binding mechanism to manage the stocks, drawing on examples elsewhere in the world. (2) A legally binding fisheries management regime would be the optimal result or tool. It would bring in key export destination states (US, Japan, the EU), fishing states (China, Taiwan, Vietnam, Thailand) and coastal states with waters in the region or claims (Malaysia, Vietnam, China, Brunei, Philippines, Indonesia). Acknowledging that achieving this would not be easy and would take a long time, steps should be taken down this path and to build support. Greater transparency highlighting fisheries practices, marine environment destruction and stock depletion in the SCS by civil society and others would be useful. Australia also has valuable expertise to lend in the development of such a framework with its long experience in establishing regional fisheries management organisations in the western Pacific, Southern Ocean and beyond. Fish stocks in the South China Sea are already a fraction of what they once were (down to as little as 5% of 1950s levels) and catch per unit of effort is a third of what it was 30-40 years ago. Trend lines indicate that we are headed to a collapse of a wide range of fish stocks. What should be a renewable resource has been made finite. Unfortunately, whales seem to get most of the positive press and protection in the world’s oceans. Some of the South China Sea fish species are making their way onto the International Union for Conservation of Nature’s “red list” of threatened species in the near extinct category. More public focus on fish species and the impact of their disappearance is needed. Depleting fishing grounds in the South China Sea will force those who usually fish in those seas further south, including to Australian waters, with implications for the environment and border security. We have already seen increasing numbers of Vietnamese fishing vessels straying into Australian waters in search of fish. They have argued in their legal defence in some cases that China is forcing them out of their traditional fishing grounds. As fish become scarcer, the risk of increased ‘fishing nationalism’ in the region rises. Domestic political pressure from disenfranchised fishermen or industries provides one of the greatest potential sources of pressure to governments in the region, which could lead to conflict. We can see this in reactions by Indonesian President Widodo last year to incursions by Chinese vessels into the Natunas, and Malaysia’s concerns over Thai fishing vessels in its Exclusive Economic Zone (EEZ). That the South China Sea is the scene of complex competing territorial and maritime claims fuelled by historical mistrusts is an understatement. Even without the major power dynamics and regional strategic overlay the legal issues are complex – involving questions of sovereignty: over territory, over maritime jurisdictions (EEZs, continental shelves and territorial seas) and the status of features and what sort of maritime zones they generate. There are also different claimants for different groups of features. The Philippines arbitral ruling(4) has provided some important clarity on which of the Spratly features are “water” for the purposes of law, namely low tide elevations (many), which are rocks (some) generating a 12 nautical mile territorial sea, or islands (none) under the UN Convention on the Law of the Sea (UNCLOS). 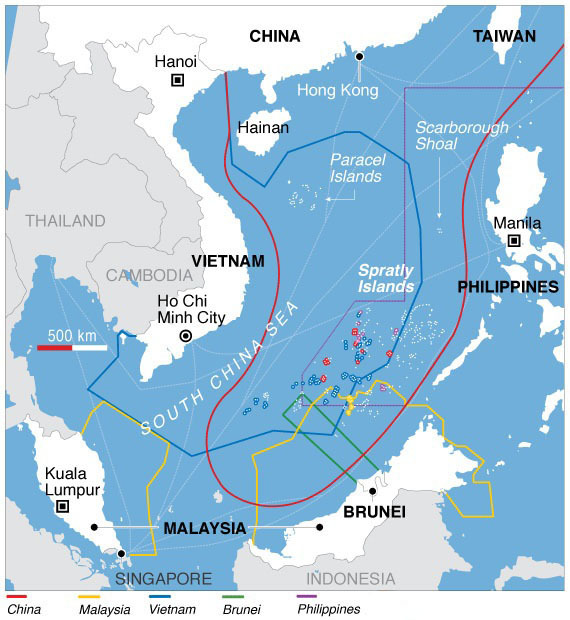 The consequence of its ruling that none of the features generate an EEZ of 200 nautical miles with the associated right to regulate and licence fishing around the Spratlys means that there is a large pocket of ‘high seas’ in the South China Sea for fishing purposes. In addition, irrespective of who the Spratly rocks belong to (on which the Tribunal did not rule), an EEZ near them could only be generated by another land mass (such as that of the Philippines or Malaysia). China has rejected the ruling and continues to insist on its nine dash line. For the purposes of this paper all of this is backdrop providing no bar to establishing a regional fisheries mechanism. Rather, it points to the need for a strong collective mechanism pending resolution of disputes. Unless something is done, fish will disappear and the marine environment continue to be degraded – with China being the standout culprit on the latter by sheer size of effort over recent years. Australia should look at setting up a regional fisheries management organisation (RFMO) and management frameworks with legally enforceable rules. The Western and Central Pacific Fisheries Convention draws in pacific island nations (and their EEZs), fishing nations and others involved in the fishing supply chain, including port states and target markets. It is explicitly without prejudice to issues of sovereignty, stating that nothing within the convention “shall constitute recognition of the claims or positions of any of the members of the Commission concerning the legal status and extent of waters and zones claimed by any such members”. Such an approach would seem particularly apposite to the South China Sea. Key distant water fishing entities like China, Japan, Chinese Taipei and the EU, all with massive fishing fleets, are members. Following this approach would involve adopting ecosystem management, catch documentation, surveillance, enforcement, and market control measures. As a first and urgent step the fate of the fishery needs to be further publicised. Transparency initiatives related to island-building activities were effective. Transparency around marine environment destruction and over-fishing could effectively be done by civil society and also highlighted in international fora. Another early step would be to consider white-listing, or a moratorium by all nations and consumers on imports of fish caught in that region unless they are certified as sustainably caught. There should be multi-party certification or through a regional organisation to prevent unilateralism. While white-listing or an import moratorium may seem extreme, negotiating any cooperative management or legally binding regime would take years given the lack of trust and competing claims in the region. Along with trust, Australia would need to build an appreciation of the gravity of the situation sufficient to enable claimants to accept the idea that, without prejudice to sovereignty, the need to cooperate to preserve the marine environment and fisheries, rather than engage in fishing nationalism, is urgent. Given the strong market forces driving fishing in the SCS, the cooperation of regional states and those beyond is needed – key target markets such as Japan (a major fish market), the US and EU would need to take action on imports. Nations like Australia with marine and fisheries management experience could offer capacity-building assistance, ranging from enhanced maritime domain awareness to expertise on sustainable fisheries management, certification and catch accounting. There are dangers in the above approach. The greatest is perhaps that China would try to take all of the SCS catch itself pushing forward with its boats and trying to ban all fishing by other countries. But China too stands to lose from a collapse of the fishery. The scope of the RFMO may well need to go beyond the SCS and encompass the South East Asian region to be effective (fish do not respect boundaries). Upcoming ASEAN summits, including the one in Australia could provide an opportunity to explore this approach. Failing to act to preserve the fisheries of the region will have serious implications for regional states and the broader international community. And it may be that trust and habits of cooperation built in addressing this issue will facilitate more trust in managing broader SCS tensions. (2) Regional states have set up a number of non-binding mechanisms or forums to try to manage marine environmental issues such as: the ASEAN Working Group on Coastal and Marine Environment, the ASEAN Maritime Forum, UNEP programs such as the Coordinating Body on the Seas of East Asia, the Expanded ASEAN Maritime Forum and others. (5) Following adoption of Sustainable Development Goal 14 at Rio +20 and with the UN Ocean Conference in New York (5-9 June 2017). Marina Tsirbas was the Senior Executive Advisor for Policy Engagement at the ANU National Security College (NSC) from June 2015 to June 2017. She was responsible, working with the Head of College, for leading the policy engagement activities of the NSC and its contribution to policy-making in the national security arena. This paper presents an updated and expanded analysis first outlined in her article in the Sydney Morning Herald on 15 June 2016.